Savings Ratio Oxygen saving is possible with conserving devices; therefore a ratio of oxygen use by an OCD compared to oxygen use by CFO therapy can be calculated. One can increase this savings ratio by decreasing the oxygen delivery by the device. This has been the basis for many manufacturers’ claims of high oxygen savings. Here is an example that illustrates how higher savings can easily be claimed: One "E” size cylinder having the same contents as another can last twice as long if the selector knob on the designated “efficient” cylinder is simply turned from “2” to “1”. Now, if the flow selector’s label on the efficient cylinder, which is currently showing “1”, is simply changed to read “2”, yet still giving flow at “1”, you have an idea of how some OCDs can obtain the claim of high savings ratio. Dose Volume The dose volume from an OCD determines the fraction of inspired oxygen (FIO2) by the patient. A higher dose volume generally means a higher FIO2 at a constant, normal breathing volume (tidal volume). 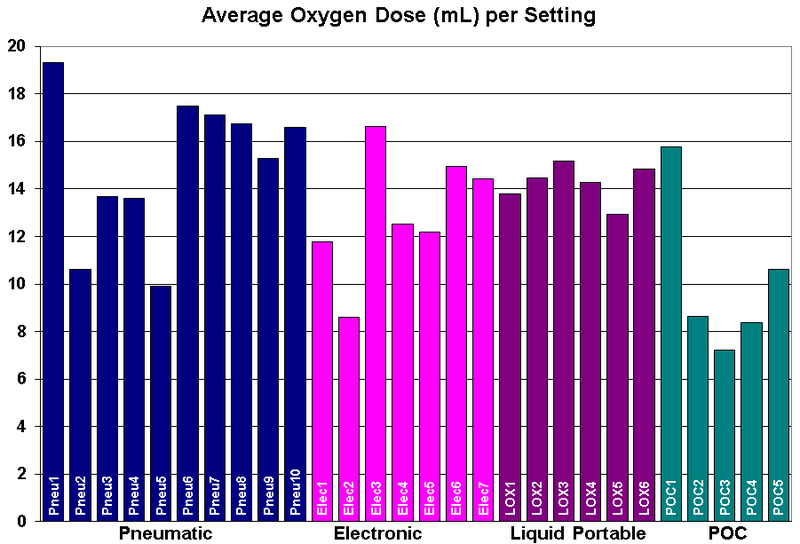 Dose volumes from various OCDs are different at the same numerical setting. Prior to using any OCD it should be determined what the dose volume per setting is. Some devices have limited maximum dose volumes and, as a result, are not suitable for patients requiring higher FIO2 at certain activity levels. Triggering Sensitivity The triggering sensitivity determines if and when a conserving device will deliver a volume of oxygen. All conserving devices need to sense a patient’s inhalation to initiate the flow of oxygen. Some devices are more sensitive than others, meaning those devices will trigger their oxygen flow sooner than the others. The first half of inspiration is important in oxygen delivery—if a conserving device is slow to respond to an inspiratory signal, it may deliver oxygen late in the inspiratory cycle and the delivered oxygen may not go to gas exchange units in the lung. Additionally, if the device does not sense a breath at all, it will not deliver its dose, and the patient will not receive oxygen for that breath. At activity, most patients have a strong signal and most devices will trigger without issue. However, sleeping patients may not generate much of an inspiratory signal and oxygen delivery may be missed on weak breaths. It is recommended that a patient wishing to use their conserving device while sleeping undergo an overnight oximetry study with the device prior to using it in the home. Timing of Oxygen Delivery There is an undefined “sweet spot” where oxygen delivery is most effective. Any oxygen delivery outside that sweet spot is wasted and does not provide oxygen to the patient’s gas exchange units (alveoli). Typically, oxygen delivered in the first half of inspiration goes to the alveoli. Oxygen delivered after a certain point in the second half of inspiration remains in the conductive passages in the upper airway, where no gas exchange occurs, and is eventually exhaled. Most pulse delivery style conserving devices attempt to deliver most of their entire oxygen dose within the first half of inspiration. Demand and hybrid conserving devices, by design, deliver oxygen all the way to the end of the inspiratory cycle, only turning off when the patient exhales. This means that the oxygen delivered near the end of inhalation is generally wasted, but the patient still receives the majority of the delivered volume. Continuous Flow Back Up Some devices provide an option for continuous flow operation in the event that the conserving device fails to operate. Typically this setting is a oneflow setting back up (e.g. 2 LPM continuous flow), though some devices do feature multiple CFO settings. Some OCDs have a fail open feature that allows the device to open to continuous flow if there is no inspiration sensed within a specific time frame. It is important for the user to note what CFO options are available to them on their device of choice.